Hi there!!! My schedule is kind of all over the place this week but believe it or not, it's given me a bit of time to get creative. 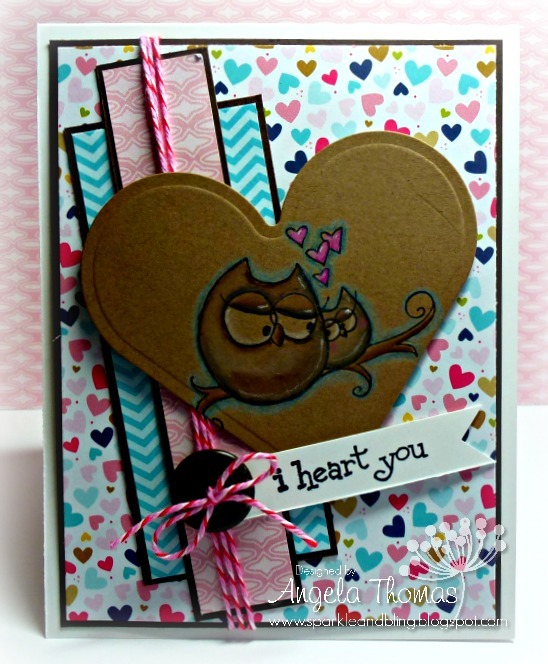 This week at "Bellatastic Tuesday" at SCS, we are challenging you to get "Lovey Dovey". For my card, I've used "Cuddly Owlies" which is currently out of stock. I didn't realize that until after I had my card made. OOPS!! I stamped the image onto Kraft Cardstock with Black Archival Ink and used my Prismacolor Pencils and Gamsol to color the image. I've been playing with my Prismas this week and I'm realizing two things (1) I love using them and (2) I need to practice more with them. Make sure you check out the new challenge over at SCS. What a great card!! Fun layout and always so neat to see coloring on kraft..very pretty!! Squeel!!! I love the coloring on the Kraft! Beautiful! !